Fitness equipment is basically anything that is used, or can be used, to get in or stay in good physical condition. Fitness equipment may be something that you have at home or something that is found in a professional gym. This type of equipment can be used for aerobic exercise or strength training, depending on the equipment involved and how it is being used. Treadmills are one common form of fitness equipment. These may be found in gyms as well as in homes. Treadmills are generally used to exercise aerobically. Treadmills are sometimes thought of as a staple in gym equipment as walking and running (when advisable for a persons current physical condition) are good basic exercises to help get ones whole body in shape. Stationary bikes may be found in both gyms and households, although due to the cost of many newer models they are more easily accessed in a gym. Stationary bikes are mainly used for aerobic training, although they can conceivably be used to strength-train as well. Weight-lifting machines can be found in just about any size and shape. They are used to exercise nearly every muscle in the body, even ones you never knew you had! The general focus of weight machines is strength-training, although they can be used in certain ways to help increase aerobic fitness as well. Gyms generally have many different types of weight machines. These machines are generally set up in such a way that they are relatively safe and easy to use. 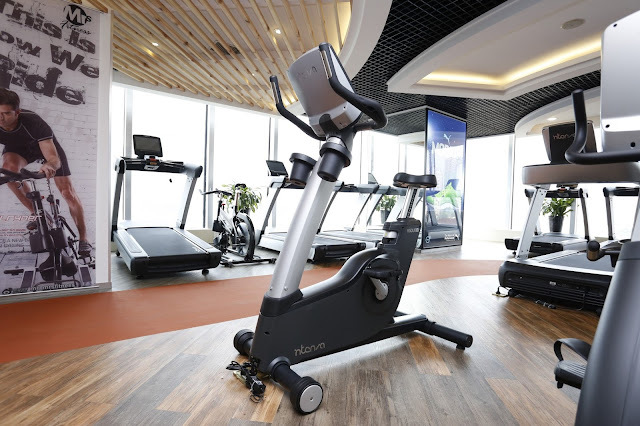 Weight machines can also be purchased for your home, but these home gyms do not necessarily have all of the features included in gym equipment and are not as specialized. Free weights are usually used for the same general purpose as weight machines, namely strength training. Free weights are many times preferred to weight machines by individuals that are trying to gain muscle or bulk-up. Free weights can be more difficult to use and dangerous than weight machines when they are not used properly. A spotter should always be used when a person is working out with free weights. Free weights are common in gyms and in households, although the diversity will be greater in a gym.